The Smithsonian National Museum of Natural History is home to some of the most valuable jewels on the planet. To me, the best ones in the museum aren’t in the Gems and Minerals exhibition. 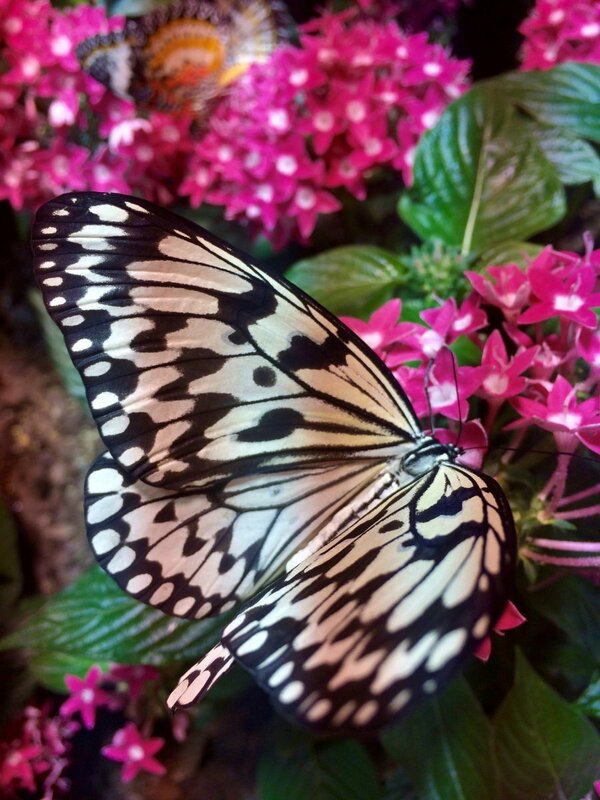 The most colorful, dazzling jewels in the museum have wings, and they are in the Butterfly Pavilion! Located on the second floor of the museum, the Butterfly Pavilion is home to approximately 40 different species of vibrantly colored butterflies and moths. It is an interactive oasis, allowing visitors an up-close experience with hundreds of these winged creatures. 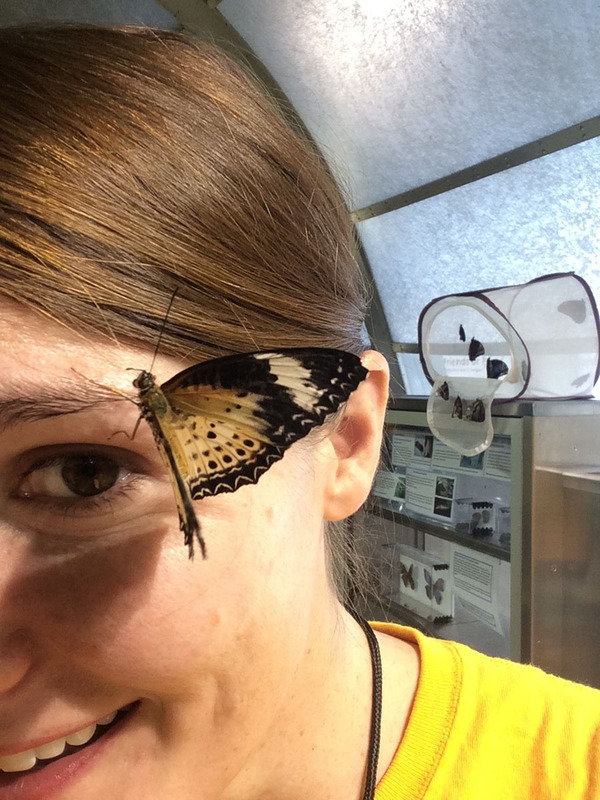 I’ve teamed up with Arthur Earle, the Volunteer Coordinator at the O. Orkin Insect Zoo and the Butterfly Pavilion, to give you the inside scoop on this hot spot. Yes, a pest management company actually sponsors the Insect Zoo. Let that sink in for a minute. What’s on the menu? Flowers, fruit, and…you! You can usually find the butterflies in the exhibition drinking fruit juice at the rotted fruit station or sipping nectar from the many flowers. But if you’re very lucky, you might feel a faint tickle as a butterfly lands on your arm, neck, or even face. Believe it or not, the butterfly might be taking a quick slurp of your sweat! The Butterfly Pavilion stays at a toasty 86°F year-round, and visitors end up perspiring quite a bit. But don’t sweat it (pun absolutely intended). Your perspiration contains several key nutrients for butterflies, so they help themselves to your soaked skin. If you look closely while a butterfly is drinking, you will see it unroll a long straw-like object from its head. This is a proboscis. This mouthpart allows the butterfly to take in liquids. Insider tip: The rotting fruit station is the best place to see a proboscis in action. The Butterfly Pavilion is packed from floor to ceiling with hundreds of butterflies and moths. But you won’t find any eggs or caterpillars. So where do the butterflies come from? The staff orders all the butterflies and moths from private breeders in the insects’ home countries (for example, Costa Rica, Ecuador, Malaysia, and Tanzania). The butterflies and moths travel to the Smithsonian in their chrysalis or cocoon stage. When the adults emerge from their chrysalis or cocoon, they are moved into the pavilion. Why doesn’t the staff just let the butterflies and moths lay eggs? Many of the species are not native to the United States. If non-native butterflies and moths laid eggs on the plants in the pavilion and those plants were disposed of, the non-native eggs could enter into the local ecosystem. Non-native species can wreak havoc on the other organisms living in an ecosystem by outcompeting them for space and food. The Butterfly Pavilion staff tightly adheres to US Department of Agriculture guidelines to prevent the spread of non-native species. Insider tip: Check the glass case in the pavilion for adults emerging from their chrysalis. If any of the butterflies are ready for release, the staff will open the case and you can watch them take their first flight! Everywhere you look in the Butterfly Pavilion, you can see lush, colorful flowering plants. The plants in the pavilion are painstakingly grown, maintained, transplanted, and placed by Smithsonian Gardens horticulturist Debra Austin. Debra uses an entire 3,500 square foot greenhouse for growing Butterfly Pavilion plants! Because the butterflies depend almost exclusively on flower nectar for food, Debra must ensure that there are actively flowering plants in the exhibition at all times. She visits the pavilion three times a week, replacing between 50-60 plants per week. The job doesn’t stop when the plants are removed. Dead plants must be placed in double trash bags, frozen for 72 hours, and finally thrown in a dumpster (and not composted). This method prevents any non-native material from escaping into the local ecosystem. Insider tip: You can see fantastic examples of butterfly-friendly plants at the Smithsonian’s Mary Livingston Ripley Garden, which is next to the Hirshhorn National Museum of Modern Art. Because the butterflies depend on the plants as a food source, the plants must stay healthy. But Debra can only use a limited range of pesticides, given that the butterflies will consume the plant nectar. So how does she keep the plants healthy? The answer is almost impossible to see! Tiny paper packets hide in some of the plants. The packets release thousands of mites that are too small for the human eye to notice. The mites spread through the plants and eat pests. Some of the paper packets also release small wasps that attack pests such as aphids. But don’t worry! The wasps are far too small to sting humans. You probably won’t even know they are in the exhibition. In addition to the mites and wasps, Debra also deploys nematodes, assassin bugs, and predatory beetles to fight back against pests. Insider tip: Using living things to eliminate pests is called biological pest control. The Butterfly Pavilion could not operate without the brilliant, enthusiastic, and friendly staff and volunteers who take care of it every day. The Insect Zoo and Butterfly Pavilion have five full-time staff members and 145 volunteers. Some of the volunteers have been working in the department for 30 years! 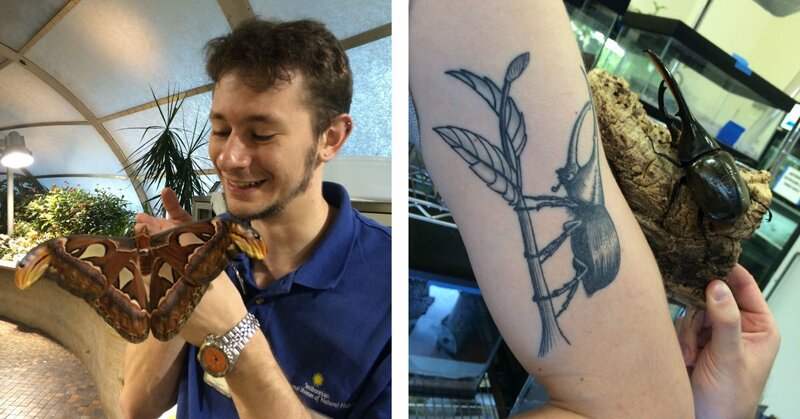 Arthur’s devotion to arthropods isn’t just lifelong, it is also permanent. He has a stunning tattoo of the Hercules beetle on his arm and plans to get a tattoo of the Hickory Horned Devil caterpillar next. Make sure to look for Arthur when you visit. He is always happy to share his knowledge of the Insect Zoo and Butterfly Pavilion! The Butterfly Pavilion is located in the Smithsonian National Museum of Natural History, and is open from 10:15 a.m. to 5:00 p.m., 364 days a year (closed December 25th). It is a fee-based exhibition (Adults: $7.50, Seniors: $7, Children: $6.50), but it is free of charge on Tuesdays. Logan Schmidt is a Curriculum Developer on the Curriculum and Communications Team. Logan learned at an early age that the only thing she liked better than science was talking to people about science, and she has spent the last twenty years pursuing that passion. Logan began her career as a teen volunteer in the rainforest and aquarium exhibits of Discovery Place Science Museum, and went on to hone her educational skills at museums, aquariums, wildlife refuges, penguin colonies, publishing companies, and the classroom. She has a B.A. in Biological Sciences and Classics from Wellesley College and a Masters of Science in Teaching with a concentration in Secondary Biology from Boston College’s Lynch School of Education. In her spare time, Logan enjoys volunteering at the USO, fishing at the Tidal Basin with her fly rod, and searching for the city’s best mozzarella sticks.